Heard a song on the radio the other day. Thought it was pretty cool and idly wondered who the singer might be. Then I catch the same song on TV and ... shudder. It's Abhijeet 'Indian Idol' Sawant. Full marks for earnest effort. Zero for guy-who-sings-whom-girls-swoon-over. Apna Ahijeet, boy next door, does not make a convincing singer of soulful ballads. Yes, the 'brand' does matter. Ears aren't impartial, they take a cue from the eyes. A recent study in the US revealed that food in McDonald's wrappers tasted better to kids. McDonald's-labeled samples were the clear favorites. French fries were the biggest winner; almost 77 percent said the labeled fries tasted best while only 13 percent preferred the others. Surprisingly, 54% preferred McDonald's-wrapped carrots versus 23 % who liked the plain-wrapped sample. If I were McDonalds I might just add a stalk or two of salad or fresh fruit and offer a 'Healthy Happy Meal'. More attracive to parents! The bottomline is branding is everywhere, and it's almost everything. Sure, many of us now buy generic products for the cost saving but in that case we put our trust in the store or retailer selling the item. "Usne rakha hai to theek hi hoga". Which brings me to the curious case of Axis bank. The renaming exercise of UTI Bank looms large on the Mumbai skyline these days. 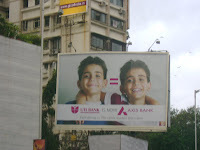 "Everything is same except for the name" explains the hoarding, featuring two identical twins. I couldn't for the life of me understand the logic behind the campaign. I mean the name was a huge part of the attraction of UTI Bank - 'UTI' being embedded in the public consciousness as a trustoworthy institution. Despite the sad state US64 was eventually reduced to. IDBI Bank, ICICI Bank, HDFC Bank, UTI Bank - all three had this mix of 'we are old, but we are new' kind of image. Of course ICICI and HDFC are way ahead of the other two in many respects. The UTI branch I visited a couple of years ago was so public sectorish I decided against opening an account even though the location was ultra convenient. If it really had to change I would have hoped other things would be tackled. The name was not really a problem! The bank had to change the name before a January 2008 deadline; that’s till when it had the rights to use the brand name of its erstwhile parent, the Unit Trust of India. UTI Bank was hived off from UTI in 2002. “The last time a bank actually changed its name in circumstances that did not involve a merger or a takeover was in 1955 when Imperial Bank was renamed State Bank of India,” says Hemant Kaul, head, retail banking, Axis Bank. A senior executive from a media-buying firm estimates ad spends for the name-change campaign to be in the region of Rs10 crore. Then there’s the cost involved in changing signages at 580 branches and 2,157 ATMs. The new name, experts say, will help the bank shed its unintended association with public sector banks and also give it an modern, global feel that could appeal to younger consumers. For example, they did not anticipate how difficult it would be to write a word like 'Axis' in 17 different languages. It took quite a while to get the maatras right. Ah, the pleasure and the pain of branding! What will they do when they want to do international business ? Ha! ... Was surprised myself.. but this UTI-Axis thing has indeed caught our eye... WIll be interesting to see if it actually serves the intended purpose! Lol.. tat was a good one! And wot do u say to showing two twins and saying the only diffrence is in their namse? Like its just a single individual and not two. They ran outta ideas I say! I liked the manner in which you brought 'Aapka Abhijeet' and McDonald's together. Like you, I loved the song, but Sawant crooning it didn't cut it for me. Thanks for also demystifying the Axis campaign with the info about the ownership of Brand Name. I've been bewildered by it. Imagine investing all that money (hoardings all over the place and 4 in a row at Marine Drive) to tell you that Hey, we changed our name. They could have also tried to improve service or speed or any other factors that may be important to customers and provide a new reason to check out UTI Bank. But No, they just spend all that Money AND proudly claim that they are still your same-old-boring-dull-as-hell bank. On Abhijeet Sawant song, I loved the song... I have still catch up on the video. For that, I need to watch television. it still on up youtube. The day it was declared UTI BANK is AXIS BANK, that was the day that they advertised happy faces on all leading front pages of daily newspapers, when the TOP Story was Sanjay Dutt going to jail. The ad was such a big distraction in between the editorial content. Think, it did the trick for them. You got it right on the button, Abhijeet and soulful ballads don't go hand-in-hand, however, with all the gizmos out there you can do miracles with the voice in the dark studios. Also, talking about McD's, you have used this particular line "Healthy Happy Meal". I think you have probably picked this line from Guy Kawasaki, where he is giving an example for Wendy's fast food in one of his many presentations. I share your wisdom and observation in Branding...Your article seems good case study for all of us..Keep it up..
Well they had to change the name and they did. The name does not sound the best of the names but then there really is no definition of a good name. Whatever the name be, the campaign seems to be successful with almost everybody noticing that the new name is in place. Its not that easy to change the name of something that big and then let people realize and remember the name. It aint that bad, the name is easy to remember, I'm sure that was rule number one! Plus, I have banked with them for three years now - yes, their *appearance* is public sector-ish, but their service (online services especially) is impeccable. The site never goes down and I haven't had a mis-transaction yet. Ugly to look at sure, but does the job. Also their ATMs are *everywhere*. Fine for me. The name change hasn't made much of a difference, and I'm happy the colours have remained the same. True, the brand is always a brand & rebranding is always a tough job. Lets wait to see if the pain of rebranding are wll borne bu UTI or Axis ....!!! Thats two sides of branding. How about the branding in FMCG for example Rin Supreme ab surf excel Bangaya campaign...?? The Multi brand Gaint HUL's Campaigns are worth intresting. Apart from Renaming UTI-Axis has long way to go in order to match ICICI & HDFC. And oh, UTI is my most favorite bank in India. I have tried them at every single place where one has been posted in India, and they delivered every single time. As a customer, i will put them above HDFC and any other bank any day! Save the pretty faces and the polite phrases for a flight - in a bank, give me great service in the least possible time. I believe reading in a financial newspaper they had to change the name as UTI (or SUUTI whatever the correct name is) demanded a certain percentage of revenues after 2007. This was decided after UTI was split into two. Obviously the powers that be decided (rightly IMHO)the brand 'UTI' wasn't worth paying for. And UTI bank is probably one of the better Indian banks in terms of image after ICICI and HDFC Bank. However much they might have spent on advertising they haven't actually bothered to change the signboards at their various ATMS and branches where you can see a cheaper cloth banner covering (or trying to cover)the older name. P.S. A new Indian social networking site which I read about first on your blog has launched a cracking TV advert. The public sectorish part is - they say everything is the same except the name. They could have clubbed a rebranding exercise with the name change - a campaign that would talk about a fresher, younger and a more agile bank would have helped better. They do have their strengths - they are at remote places and small towns, could have used this opportunity to make the people aware of it. What is wrong with PSU banks? They have lower or in most cases no fees for heir accounts. They give better rates to interest for depositors and borrowers. They have better all roudn customer service-unlike private banks to rush to give you a loan and then later forget you. Is it just irrational prejudice????? have you heard Karunya's Album? It tells that only good voice cannot make a good album. Brand name is necessary too. One more thing, isn't Abhijeet' voice nasal in the song? Moral of the story: Use google/yahoo/altavista/your favourite search engine and do some research before hurling out ignorant words for everybody's entertainment. Anybody else is interested in getting a FREE MC DONALD'S GIFT CARD?